Based on reviews from 61,058 users. Learn how our rankings work or see our guide to Adidas Superstar sneakers. Updated Apr 2019. 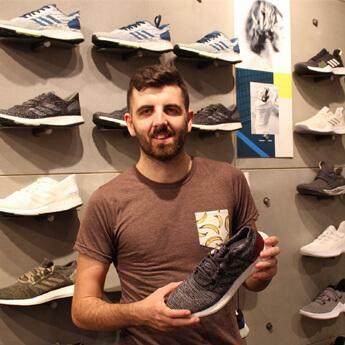 Running next to the Adidas Stan Smith, the Adidas Superstar sneakers have been tagged as one of the most successful Adidas kicks in the history. The iconic silhouette features the herringbone-patterned rubber outsole that provides optimum traction while its durable shell toe offers reliable forefoot protection. For more than 35 years, the Adidas Superstar has been redesigned in different materials and styles as it became part of the youth’s fashion culture. The myriad of colors like black, beige, purple, red, blue, and white only serve to make these Adidas Superstar sneakers all the more a must-have accessory. Adidas also made partnerships with music artists and fashion designers, among other celebrities, to innovate Adidas Superstar Sneakers as the brand continues to adapt and meet the modern fashion sense of the sneaker culture. Every collaboration is different from the others as it aims to show the diverse representations and culture. As Adidas teamed up with Pharrell Williams, they created amazing and unique apparels and sneakers for the 2015 summer collection. They were able to launch a collection that utilizes the Bionic Yarn which is a re-engineered ocean debris into usable materials. With Williams’ brilliant mind joined force with Adidas’ capability in providing fashionable, durable and functional footwear, they were able to birth unique designs of sneakers in their collaborations. One of which is the Adidas Superstar Color Pack. This version features 50 monotone colorways for the Spring 2015 season. To encourage the people to embrace their individuality, Williams called this collection as a “celebration of equality through diversity.” It is available in all rainbow colors as well as every shade in between. The collection was released in the market on March 27, 2015. Rita Ora, a British star, joined Adidas as they fueled the collaboration with their mutual appreciation. Adidas Originals approached Ora and offered to express her style by designing for the brand. Ora’s eclectic design debuted with a bang, focusing on modern and sporty staples that have eventually become her signature style. Her partnership with the brand is among the notable Adidas Superstar sneakers collaborations. Leaning towards the ‘80s design, the classic Adidas Superstar sneakers has vivid Technicolor and playful design that stylishly appealing. The Adidas x Rita Ora Superstar 80s has printed canvas upper with three-stripes overlays. It has the durable herringbone outsole that delivers optimum traction. Like other Adidas Superstar Sneakers, it has the rubber shell toe that gives the nostalgic feel of the classic. In collaboration with the Japanese Brand White Mountaineering, Adidas launched another variation of the Adidas Superstar Sneakers which is a classic remastered with textured Primeknit. Fusing modern innovation with iconic street style, this version has the Boost cushioning technology that ensures responsive and energy-returning performance. Among the Adidas Superstar Sneakers, this eye-catching iteration features a mélange knit upper with complimentary laces and muted eyelets as well as white toe caps and midsoles. The upper perfectly blends and juxtaposes with the accented contrasting three-stripes overlays. Among other collaborations made for the Adidas Superstar sneakers is when Adidas partnered with the Japanese clothing brand BAPE that specializes in women’s, children’s and men’s lifestyle wear. They also tag the brand NEIGHBORHOOD for the ride. The trio teamed up and came up with a contemporary overhaul of the classic Adidas Superstar which utilizes Primeknit and Boost technologies. This pair of Adidas Superstar sneakers has a premium suede upper that is accented by the serrated 3-stripes branding with black details. The legendary shell toe is cast in white, and the NEIGHBORHOOD and BAPE brandings are embroidered on the upper as well. Adidas partnered with Jeremy Scott, an American fashion designer and creative director of Moschino, as they created a tamer version among other Adidas Superstar sneakers. Adidas Superstar Wings has an all-white upper accented with a black shade on the heel patch and three-stripes branding at the lateral side. Reminiscing the Adidas JS Wings 1.0, this limited edition has wings adorning the toe box which are undoubtedly eye-catching. It also has rubber outsoles with herringbone tread for sure grip while the leather lining offers added comfort. Time and again, the Adidas Superstar has been redesigned and re-released several times in different versions and styles. It became one of the major influences to meet the needs of the modern day sneaker culture. Several variations of the Adidas Superstar sneakers could be skate, basketball or hiking-inspired. Let’s try to check them out. Possessing the aesthetics of a basketball shoe, these Adidas Superstar sneakers are relatively fashion-forward to pair with a variety of outfits. Aside from bearing a sporty look, these sneakers are stylish enough to become part of lifestyle wear. Check out some of the basketball-inspired Adidas Superstar sneakers. Adidas Superstar 80s Metal Toe – Released in the spring/summer of 2015, it was so popular that celebrities like Kendall Jenner and Kendrick Lamar were seen wearing it. This kick is up for grabs at an affordable rate. Construction: Featuring the metallic shell toe, it has a lace-up system on a full leather upper with 3-stripe branding at the lateral side and embossed metallic logo on the heel counter. For added elevation, this retro Superstar has a one-inch heel with the durable outsole that offers reliable traction. Sizing: It is a unisex shoe that is available in sizes ranges from 4 to 13 and 4 to 11.5 US for men and women respectively. Adidas Superstar Suede – Among the iterations of the iconic Adidas Superstar, these stylish Adidas Superstar sneakers, which have been a fan favorite for decades, can be availed without breaking your wallet. It displays a perfect blend of casual and sporty styles. Construction: The upper is made of nubuck leather with fabric lining to provide breathability and comfort. It has a lace-up system that offers an adjustable fit while the sturdy rubber outsole and shell toe delivers reliable traction and forefoot protection respectively. Sizing: The Adidas Superstar Suede is available for men and women in sizes from 6 to 13 and 5 to 11 US respectively. Adidas Superstar Vapour Steel – Using the popular shade “vapour steel,” this sneaker has an added twist that meant to mesmerize its patrons. Construction: It has a snakeskin-textured leather across the base and tongue. The 3-stripe branding is shaded in white which creates a sharp contrast to the shoe’s overall look. The Adidas branding in a combination of gold and black hues is placed on the tongue. Sizing: This unisex pair of sneakers is available in sizes 5.5 to 12.5 US for women. Men can grab it by just sizing 1.5 up to get their fit. Adidas Superstar 80s Clean – As the name implies, these Adidas Superstar sneakers have a simplistic look and unique design without compromising comfort. Up for grabs at an affordable rate, they are available in monochromatic, neutral and vibrant tones that look good with sporty and casual clothing. Construction: Providing sufficient support, the Adidas Superstar 80s Clean has a Horween or suede leather upper. It utilizes Ortholite sockliner to keep the feet odor-free and dry while the rubber cupsole with a herringbone tread delivers a sure grip. Giving an added comfort, it has a soft leather lining. Sizing: Commonly fits true to size, this shoe is unisex. Men and women can grab sizes from 4 to 14 and 5 to 13 US respectively. Adidas Superstar Bounce – Providing an all-day and energized comfort, this relaxing pair of Adidas Superstar sneakers also showcases versatility. Up for grabs in an affordable price, its stylish silhouette can work well with sporty and casual getups. Construction: The Adidas Superstar Bounce has a breathable mesh upper that keeps cool and odor-free. Giving a classic look, the rubber shell toe remains. Along with the shell toe, the leather heel patch boasts a robust tone that adds a dash of class. For reliable traction, it has the rubber outsole with the herringbone tread. It is finished with reflective three stripes. Sizing: This low-top shoe is unisex and is available in men’s sizing from size 4 to 14. Ladies can grab a pair by getting 1.5 sizes down from the men’s sizing. Adidas Superstar RT – Known for having a comfortable feel, this low-top sneaker expresses simplicity in its fashion-forward design. Available at an affordable rate, it has an updated and monochrome-colored upper with the classic rubber shell toe. Construction: It has a suede upper with micro perforations all over for maximum breathability. The synthetic leather lining offers comfort while the herringbone tread-pattered cupsole provides reliable traction. Sizing: This unisex shoe is available in a medium width. For men, sizes available range from 4 to 14 while 5 to 15 for women. Adidas Superstar Adicolor – these low-top Adidas Superstar sneakers have a reflective and monotone-colored upper with a matching pair of laces. Available at an affordable rate, they have a straightforward design that is decorated with a suede heel panel and a durable rubber shell toe. Construction: The Adidas Superstar Adicolor has a perforated leather upper that offers breathability and comfortable stride. Its rubber cupsole with the herringbone tread surely provides excellent traction while the synthetic lining gives additional comfort. Sizing: This unisex shoe generally runs true to size. Men and women can pick sizes from 7 to 14 and 4 to 11 US in medium width respectively. Adidas Superstar 80s DLX – An improved classic white Superstar, this version features a black Trefoil label on the heel patch and a gold Trefoil branding on the tongue as well as the shell toe and vintage-inspired gum outsoles. Construction: Adidas Superstar 80s DLX has a full-grain leather upper that provides breathability and leather lining for added comfort. For reliable traction, it has the rubber cupsole with a herringbone tread pattern. Sizing: This lace-up sneaker runs true to size and is available in a medium width for men and women. Women’s sizing ranges from 3.5 to 12 while men’s start from 6 to 14. Adidas Superstar Animal – Available at a budget-friendly price, it has an upper that mimics the animal’s skin like the snake and ostrich. The animal texture is also embossed on the three stripes overlays as well as to its matching heel tab, giving a subtle twist on its classic version. Construction: It has the herringbone-patterned cupsole that provides optimum traction and the signature rubber shell toe for forefoot protection. The upper is made of leather that offers sufficient breathability. For an added comfort, it has a lightly padded collar and tongue. Sizing: This shoe is available for men in sizes ranging from 5 to 12 US in medium width. Women who would like to grab a pair may do so by sizing 1.5 down. Adidas Superstar 80s CNY – In celebration of the Chinese New Year and year of the dog, the classic hoop design pulls a festive feel with the Chinese character for “longevity” embroidered on the heel patch. Construction: It has perforated three-stripes with red accent and full-grain leather upper that provide ventilation. To ensure comfort and performance, it utilizes the Ortholite sockliner. It has a durable outsole that offers a sure grip while the classic rubber shell toe gives forefoot protection. Sizing: The Adidas Superstar 80s CNY is a unisex shoe that generally runs true to size. It is available in men’s sizing from 9.5 to 13 US in medium width. Ladies just need to get a 1.5 down from what they normally order since the sizes are taken from the men’s measurement. Adidas Superstar 80s Decon – Given a significant overhaul, these classic Adidas Superstar sneakers have a new deconstructed silhouette. Stripping everything off, they don a minimalist design yet still manage to draw attention from others. Regardless of their premium price, they are still worth the money for they are injected with a contemporary appeal without sacrificing comfort. Construction: Wrap around the upper, it has a single-layer premium leather upper with the laser etched of the 3- stripes branding at the lateral side and laser-engraved logo on the heel counter. It has a durable rubber outsole for an optimum grip. Sizing: Comes with a traditional lace-up closure system, the Adidas Superstar 80s Decon is available in sizes ranges from 5 to 10.5 and 5 to 14 for women and men respectively. Adidas Superstar 2 – Definitely a crowd favorite, the low-top Adidas Superstar 2 has the classic three-stripes overlays at the lateral side, round shell toe and the Trefoil branding on the heel patch. An up for grabs at a budget-friendly price. Construction: Compared with the OG, the Adidas Superstar 2 provides more cushioning around the heel and has more padding on the tongue for added support. It has a silk lining that gives a more comfortable feel. The abrasion-resistant rubber outsole offers sufficient stability and optimum traction. Sizing: This low-top sneaker is a unisex shoe. Although it generally fits true to size, others with wide feet may find it tight-fitting, so it was suggested for them to size a half or full up. Adidas Superstar Xeno – Utilizing a color-shifting technology, the Adidas Superstar Xeno is inspired from the xenopeltis unicolor or commonly known as the sunbeam snake which has highly iridescent scales. Construction: The synthetic upper has a potent-changing ability when hit by direct light. This sneaker features 3M reflective technology that appears black with a faint iridescent quality in natural daylight and explodes into shades of rainbow under the camera flash. It has the classic rubber shell toe and outsole. Sizing: Unlike other unisex Adidas Superstar sneakers, this version is available only in men’s sizing ranges from 4 to 14 US in medium width. But if women really want it, they can order 1.5 sizes down from their usual foot measurement. Adidas Superstar Boost – Following the success of Adidas Superstar sneakers in 2016, the brand followed up with an updated version in 2016. It features the Boost technology which is a sought after cushioning system. Construction: It has the traditional lace-up system for an adjustable fit. The Boost technology is craftily tucked inside the cupsole. The herringbone outsole offers a sure grip on any surface. Sizing: It generally runs true to size. The Adidas Superstar Boost is available in men’s sizing ranges from 4 to 14. Adidas Superstar Bounce Primeknit – Available at a budget-friendly rate, this sneaker can be used for both fashion and athletic purposes. Construction: This sneaker has a Primeknit technology that embraces the upper, providing ultra comfort and breathability. It also utilizes the Bounce technology on the midsole that delivers all-day comfort. The shell toe is kept intact. Giving optimum traction, the herringbone tread is installed on the rubber outsole. Sizing: Offered in men’s sizing, it is available in sizes ranges from 3.5 to 13 in a medium width. Women can grab a pair by ordering 1.5 sizes smaller than their usual foot measurement. Adidas Superstar 80s City Series – Another addition to the family of Adidas Superstar Sneakers, this edition takes the cue from the vibrant shades ‘80s shoes. Visible on the outer heel is an icon highlighting the respective landmark of Berlin, New York, London, Paris, Tokyo or Shanghai is embossed in gold. Its vibrant silhouette shows a perfect blend of modern and traditional styling with seamless ease. Construction: These tonal Adidas Superstar sneakers sport a full suede upper that provides support and a comfortable fit. Showcase in a monotone aesthetic, the rubber toe box has an extra wiggle room. The rubber outsole offers optimum traction. Sizing: Offered in men’s sizes, this sneaker is available in sizes ranging from 4 to 14.5 US. If ladies want to grab a pair, they need to simply pick 1.5 sizes smaller than their normal foot measurement from the men’s sizing. Adidas Superstar 80s Remastered – It features a jagged rippled rubber sole, an oversized tongue and a leather patch with the gold Trefoil branding on the inner quarter of the upper. Construction: It has a breathable leather upper and neoprene sockliner which provide comfort and support. The fish-skin detail heel tab helps the foot to slip into the shoe while the rippled outsole gives excellent traction. Sizing: This unisex sneaker comes in B and D medium width for men and women in sizes ranging from 7 to 13 and 4 to 11 respectively. Adidas Superstar Festival Pack - Following the City Series, the Adidas Superstar Festival Pack is available in monochrome palettes. The lacing and the three-stripes branding are completed with a tonal treatment while the toe box and midsole are in contrasting white shade. Construction: It has a bright canvas upper that offers breathability while the midsole cushioning provides comfort. The herringbone-patterned rubber outsole ensures reliable traction. Sizing: Exclusively offered for men, the Adidas Superstar Festival Pack runs true to size. It is available in sizes ranges from 6 to 13 in D-medium width. If ladies are interested in getting a pair, they just need to get 1.5 sizes down than their normal foot measurement. Adidas Superstar Foundation – Paying homage to the classic, this version boasts the simplicity of the silhouette and is made of premium materials. The Trefoil logo is printed on the heel patch, and the Adidas branding is accented in gold on the tongue area. Construction: It has a full-grain leather upper that offers ventilation while the soft textile lining gives an added comfort. For a sure grip, it utilizes the herringbone tread rubber cupsole. Sizing: The Adidas Superstar Foundation is offered in men’s sizing ranges from 3.5 to 19 US. Women can try a pair by getting reducing 1.5 sizes from the men’s sizing to accommodate their foot measurement. Adidas Superstar BW Slip-On – Forget about the laces with one of the updated silhouette of the iconic Adidas Superstar sneakers. It is styled with a more relaxed feel and unique design. The elastic strap with 3-stripes graphic runs from the tongue to the toe, adding style to the eye-catching silhouette. Construction: Utilizing OrthoLite® sockliner, it ensures to deliver an all-day comfort while the rubber outsole provides reliable traction. It has a plush of suede or upper that offers optimum breathability, keeping the feet bacteria- and odor-free. Sizing: This slip-on runs true to size. It is available in women’s sizing ranges from 3.5 to 8.5 US. Adidas Superstar Slip-On – Debossing the Adidas Trefoil insignia on the tongue and side, it has a radical and new look that draws attention from others. It has a stretchy design that you can easily slip your feet on and off. The sophisticated Adidas Superstar Slip-On is available at a budget-friendly rate. Construction: The sneaker has a waffle-textured upper that offers breathability while the crisscross straps are placed instead of laces. The herringbone tread on the outsole ensures a sure grip, and the Ortholite insole and textile lining provide exceptional comfort. Sizing: The Adidas Superstar Slip-on is available for women in sizes 5 to 11. Others perceived the shoe to fit larger than usual, so some suggested sizing down to achieve a sock-like and snug fit. Adidas Superstar Bold Platform – Inspired by the ‘90s platform outsole, these Adidas Superstar sneakers have metallic gold accents on the branding detailing at the side panels and on the tongue which give a premium look. These shoes are a value for the consumers’ money. Construction: This sneaker has a full leather upper and a durable shell toe with a thick midsole, providing foot breathability, comfort, and protection. A great value for the money, it also has an Ortholite removal insole for added cushioning and support. Sizing: Generally, runs true to size, the Adidas Superstar Bold Platform is available for women in sizes ranges from 3.5 to 11. Adidas Superstar 80s Cut-Out – Available at a reasonable-priced rate, this pair of retro sneakers is created with charm and designed for women. It has creative laser cut-outs with an eye-catching geometric pattern on the upper. The debossed logo is at the heel and on the tongue. Construction: It has a two-layer leather upper with star-shaped cut-outs, creating a multi-dimensional look and keeping feet fresh and dry. It has leather lining and sockliner that offer comfort while the herringbone-patterned rubber cupsole provides reliable traction. Sizing: The Adidas Superstar 80s Cut-out is available in sizes 3.5 to 11.5 for women. Due to its deconstructed style, it is perceived to run large than the classic Adidas Superstar shoes, so it is suggested to size down. Adidas Superstar UP – Released in 2015, this high-top sneaker is made exclusively for women, featuring a removable and hidden wedge heel. Also popularly known as the Adidas Superstar UP Wedge, it exudes a street style with aesthetic appeal that matches a variety of outfits. Construction: Depending on the colorway, this footwear is crafted with a leather or canvas upper. For added comfort, it has a breathable textile lining. The rubber outsoles provide an optimum grip. The shaft approximately measures 4.5 inches from the arch. Sizing: This women shoe is available in sizes ranges from 5 to 12 US in a medium width. Adidas Superstar UP Strap – Oozing with a cool street vibe, this high-top sneaker has a midfoot strap rounds out on its sleek silhouette. It also boasts luxe details as well as an old school vibe which undoubtedly draws attention from others. Construction: It has a full-grain leather upper that ensures breathability while its textile lining offers a comfortable feel. The traditional herringbone-patterned outsole keeps its user from slipping. Sizing: Designed for women, this high-top sneaker is available in sizes ranges from 7.5 to 11 US in medium width. It is advised to get a half size bigger than the usual size since some wearers reported it to run small. Below are some of the low-top Adidas Superstar sneakers which are skate-inspired. Adidas Superstar Vulc ADV – Based on the original edition shoes skated by Drake Jones, Kareem Campbell, Richard Angelides and Joey Bast back in the ‘90s, the Adidas Superstar Vulc ADV has a lighter and slimmer silhouette that aims to deliver better skate performance. Construction: The Adidas Superstar Vulc ADV features a removable ADIPRENE sockliner and midsole for heel impact cushioning and excellent board feel. It utilizes Vector Traction outsole that offers grippy wear and excellent board control. Depending on the colorway, it has a suede or leather upper that provides breathability. Sizing: Offered only to men, it is available in sizes ranges from 4 to 14. However, if ladies want to have a pair, then they can order 1.5 sizes down from their usual sizes. Hiking-inspired Adidas Superstars shoes not only display an aesthetic appeal but are also infused with performance technologies on its casual design. Adidas Superstar 80s TR – Featuring a bold olive hue upper decorated by a white toe cap with vibrant red heel accent, it is a reworked version that draws from the aggressive look of a durable trail ready boots. It is available at a slightly expensive rate. Construction: It is designed with a chunky rubber midsole and a toothy traction outsole to help users navigate rough trails. Sizing: It is a unisex shoe. Initially designed for basketball above all else, the Adidas Superstar sneakers also have become a part of the fashion trend of all generations. While maintaining its original varsity vibe, the Superstar’s timeless silhouette is undeniably eye-catching that even celebrities appreciated it and are seen wearing it. Let’s check this out and get some ideas on how they would pair their Adidas Superstar sneakers with their getups. As timeless as the classic white sneaker, Kylie was seen elevating her white pair of Adidas Superstar sneaker with oversized sunglasses, a formfitting dress and leather handbag. Wearing a simple turtleneck, leggings, and sunglasses, Gigi displayed a perfect combination of sporty and glam look with her pair of white Adidas Superstar. She was also seen wearing the white sneaker with a pom-pom hat and lace-up pants for an ultimate cool and girly look. The songstress from New Zealand was seen rocking a white pair of Adidas Superstar along with her plunging black, long-sleeved blouse and black and red checkered pants. Displaying an all-black look, Dakota was wearing a pair of black skinnies and trench coat with her white Adidas Superstar. She also wore a colorful bag for an added style. Emma wore a pair of distressed denim jeans and oversized sweatshirt along with her well-worn white sneaker, giving an ultimate laidback look. Wearing a chic trench coat and a pair of skinny jeans, Emma was seen walking at the airport using her white Adidas Superstar sneaker. Rocking on her white sneaker, Kristen wore a pair of cuffed skinny jeans topped with a gray shirt and black leather jacket that give an edgy twist. For a feminine and sporty getup, leave it to Rita. She was seen wearing her white Adidas Superstar with a two-piece set of clothing. Katie wore a lace and velvet Alberta Ferretti dress with her white sneaker with red three stripes, displaying a bit formal yet sporty look. For a weekend vibe, Kate wore a pair of joggers and topped with a graphic shirt and paired with the pair of white with 3 black stripes kicks. Talking about the queen of chic, Victoria wore with sophistication her Adidas Superstar and matched it with a chic black coat, track pants and sunglasses. A winning combination like the cuffed denim jumpsuits and a khaki jacket were worn by Naomi with her classic Adidas Superstar. Backed in the ‘90s, the Adidas Superstar sneakers was a popular skate shoe. Although there’s now the Adidas Skateboarding line, Chris Hall attested that the "Shelltoe Superstars” were great. Not only an iconic part of hip-hop, but the Adidas Superstar was also first to become part of basketball. It was the first low-top basketball shoes with an all-leather upper that technically started as the advanced hoops shoe. The original Adidas Superstar shoes were made in France, not in Germany. The OGs have a golden Adidas logo on the tongue. The brand’s best selling-sneaker is not the Adidas Superstar, but the Adidas Stan Smith, which has sold for over 40 million pairs and counting. How was the Adidas Superstar born? Back in the ‘60s, the basketball players wore shoes that were made of canvas materials with minimal foot support leading to knee and ankle injuries. Adidas created a shoe with a durable shell toe that provided reliable forefoot protection, hence the Adidas Superstar is born. What is the significance of the Trefoil logo? Symbolizing the Spirit of the Olympics, the Adidas Trefoil logo is derived from the Latin word meaning “three-leaved plant.” The three leaves signify Europe, Asia, Africa and the United States while the lines across the leaves symbolize diversity. Are Adidas Superstar sneakers unisex shoe? Yes, the revived fashion trend has always been available for men and women. Sometimes, Adidas also uses distinguishing colors to indicate femininity or not. What started the Adidas Trefoil logo? Backed in the ‘60s, Adidas started to conceptualize a logo that will symbolize their diversity when they planned on expanding their business into apparel and leisure. The Trefoil logo debuted during the 1972 Olympics in Munich, Germany. In 2001, Adidas decided to use the Trefoil logo to the Adidas Originals exclusively. How do you style Adidas Superstar shoes? The Adidas Superstar sneakers are available in a variety of iterations and can be styled in a gazillion ways that match an individual fashion preference. The versatile and stylish pair of Adidas Superstar sneakers perfectly looks good with skinnies, joggers, shorts, khaki pants or skirts. Aside from casual clothing, it can also be matched with dresses or other semi-formal outfits. What kind of Adidas did Run DMC wear? In the early ‘80s, the Adidas Superstar was dead, but Run DMC brought the shoe back to the fashion world. What does the name “Adidas” stand for? It is a portmanteau of Adolf Dassler’s name, founder of the brand. “Adi” came from Adolf while “das” was from Dassler. What are the ways to remove odor from Adidas Superstar sneakers? You can sprinkle with baking soda and let it sit inside the sneaker overnight. Another way is to crumble and stuff newspaper into the shoes to soak up moisture or one can put orange peels and let it sit overnight too. Is there a difference between men’s and women’s Adidas Superstar shoes? 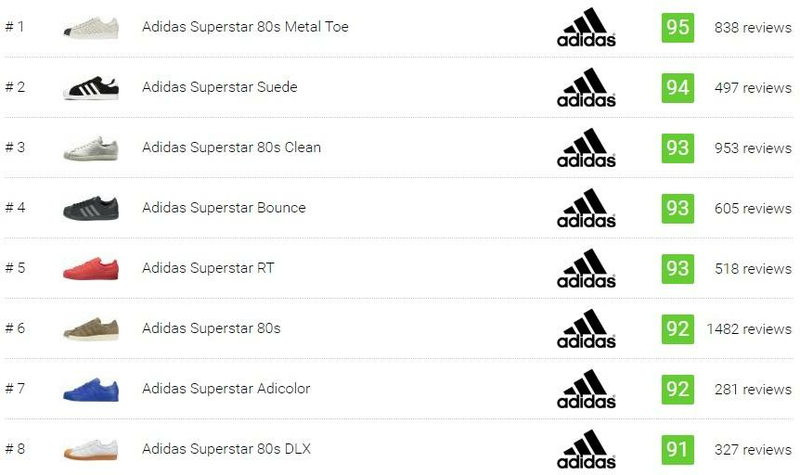 Most of the Adidas Superstar shoes are unisex. However, there are a few Adidas Superstar sneakers that are explicitly made for women which can be observed with the femininity of the design. When it comes to the length in sizing, men’s are perceived to be larger than women’s. So if your usual size in women’s is 8, then you need to ideally order 6.5 if it is in men’s sizing.